The new ILRI-led project will develop and test approaches for improving the productivity and market competitiveness of pig farmers. In the preliminary proposal presented at the workshop, ILRI shared three objectives of the project which are (i) to assess demand for different breeds of pigs (indigenous, cross-bred and exotic), (ii) to assess mechanisms of pig feeding to improve indigenous and cross-bred pig production to match market demand and the opportunities and constraints of various farming systems, and (iii) to introduce and test new business models. Participants at the workshop discussed these objectives and suggested ways of improving them and the project design. This information will be used to refine the project proposal. Group discussion during the visioning exercise of pig farming in the next 15 years (photo credit: ILRI/Chi Nguyen). Indigenous pig production is one of the traditional activities of ethnic minority groups in northwest Vietnam. But many participants said pure indigenous pigs are slowly disappearing and are being replaced with indigenous cross-breeds and exotic pigs in most households in the region. Some participants felt that pork from the cross-breeds, which are fed industrial feed – complete feed rations used by commercial piggeries – were less tasty and less preferred by consumers than meat from pigs raised with traditional feed – household food remains and crops. They said traditional feeding would ensure pork quality that meets the demand of most consumers, particularly those in cities who are also concerned about food safety. Findings from the scoping study that was discussed at the workshop show that many pig farmers sell maize grain to traders at a low price and instead buy industrial feed to feed their pigs; resulting in low or no profits from their pig and maize farming. Participants identified maize as one a key substitutes to industrial feed that can also reduce feeding costs. Moreover, in the context of climate change, the local authorities of Son La and Hoa Binh provinces said they will restructure rice production to avail more land for maize farming. The anticipated increase in maize production from the increased area can provide cost-effective feed for pigs in lieu of purchased industrial feed. Participants, however, said that using maize as pig feed will require a change in pig production and management practices such as in ensuring appropriate feed ration balancing to achieve optimal growth of the animals. New technologies of process maize for use as animal feed will also be required. ‘In addition to evaluating the economic impact of the proposed new business models in households, feedback from traders, slaughterhouses and consumers on meat quality will play a key role in enhancing the competitiveness of smallholder pig farmers,’ said Dao The Anh from the Centre for Agrarian Systems Research and Development (CASRAD). He said strengthening farmer groups will also help small-scale producers gain better access to markets. All participants at the workshop (photo credit: ILRI/ Chi Nguyen). 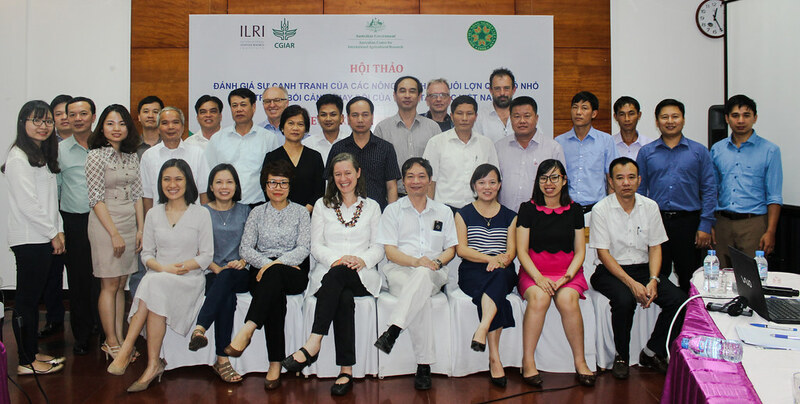 Participants in the workshop also included staff from projects funded by the Australian Centre for International Agricultural Research (ACIAR) such as the ‘Reducing disease risk and improving food safety in smallholder pig value chains in Vietnam’ (PigRISK) and researchers from ACIAR, VNUA and ILRI. The workshop was part of a nine-month scoping study (October 2016 – June 2017) for the ‘Assessing the competitiveness of smallholder pig farming in northwest Vietnam’ project, which is funded by ACIAR. It is aligned with the CGIAR Research Program on Livestock. Tags: Crop-livestock, East and Southeast Asia, ILRI, maize, northwestvietnam, Pigs, vietnam. Bookmark the permalink.